Haji Abdul Hamid struggles to walk with his new prosthetics at the Handicapped International clinic inside the Mirwais hospital compund October 11, 2009 Kandahar, Afghanistan. 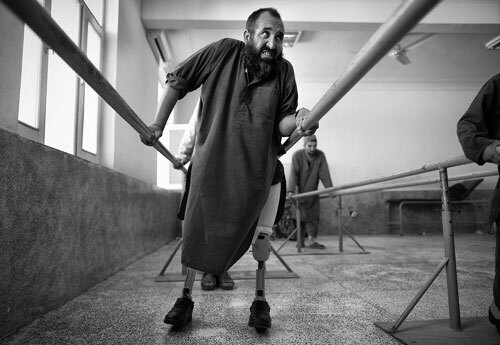 Haji lost both of his legs from a I.E.D blast along a road in Helmand over a year ago. He was injured while riding on his motorcycle along with his brother-in-law who was killed. Mirwais hospital in Kandahar city is the largest regional hospital in the area, supported by the ICRC and the Afghan government it caters to most of the war wounded in the most hostile part of the country. 2009 was the deadliest year in terms of civilian casualties in Afghanistan ever since the start of the U.S.-led war against Taliban in the country. The Taliban are now staging suicide attacks and IED blasts in densely populated areas to create a bigger impact as more of Afghan's war wounded hit the headlines. Relations between Afghans and the American and NATO forces have become more fragile with every passing day.